Day-dreaming of ocean breezes, blue skies and white sandy beaches? Ahh, the Whitsundays, a magical coastline of tropical paradise, conveniently located only a short hop, skip and a jump away. 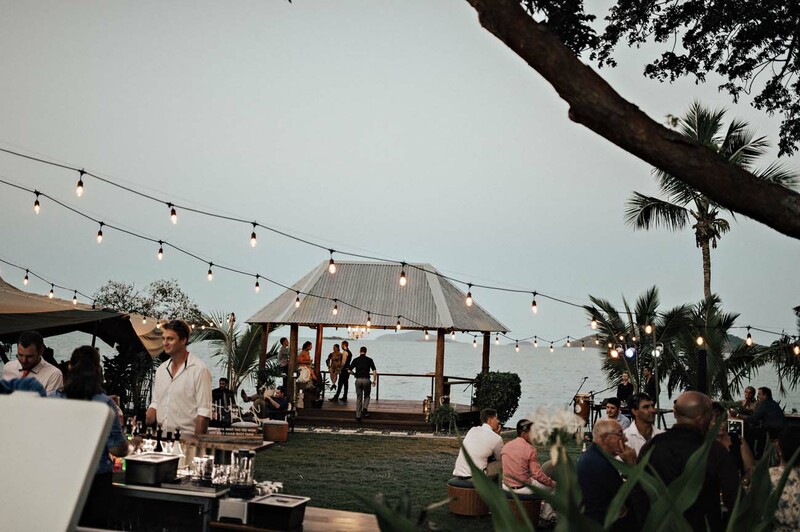 If you’ve just discovered Queensland’s hidden gem then no doubt you’re embarking on that overwhelming task of finding the perfect Whitsunday wedding venue to match the stunning backdrop. Not sure where to start? We’ve taken the opportunity to break it down for you, from saying you “I Do’s” on any of our dazzling local beaches, to all-inclusive resorts. From luxury yachts (it is the Whitsundays after all) to private estates boasting magnificent settings and specialising in the ‘big day’, there is no shortage in finding a wedding venue that suits your vision, style and budget, and all that boast the breath-taking backdrop of the Coral Sea soaking in that beautiful Queensland sunshine. The Whitsundays is a vibrant hub of stunning coastlines, lush tropical gardens, waterfalls and mountain ranges (to mention a few). 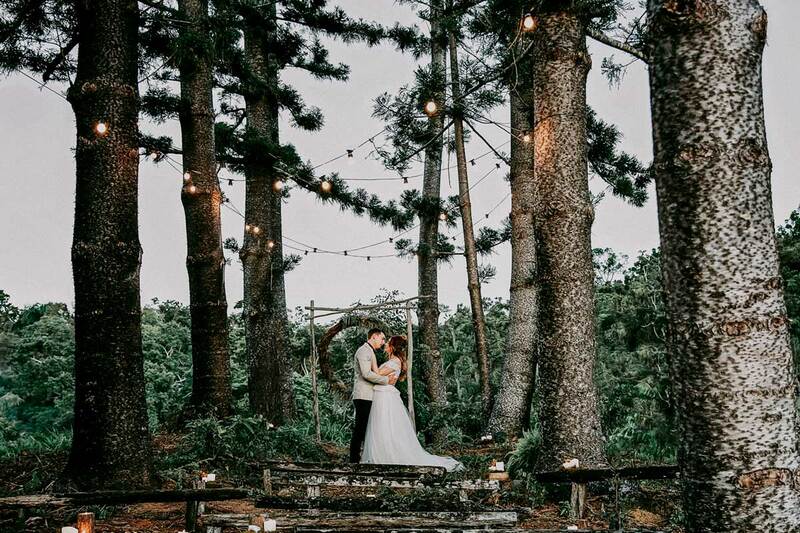 You really don’t need to look far into finding hidden nooks and spectacular backdrops that make the perfect place to get hitched and all simply on public land. Getting married on public land is budget friendly, flexible, and by boasting such a variety of locations it keeps your day special and unique. Do keep in mind that getting married on public land does come with its own set of logistics and considerations: permit applications, the chance of passing onlookers, and let’s not forget the pesky weather. This is where we recommend getting some help from the pros and bringing in a wedding planner to handle all the fuss and details, leaving you to just soak up the scenery and the love. Get married under the palms on Airlie Beach Foreshore, or in the manicured lawn of Headland Park. You can opt for a backdrop of the yachts at Shingley Beach, or nestle under the shade of Whisper Bay Park. Why not go slightly further afield take a flight over the islands to dip your toes in the white sand and clear waters of the breath-taking Whitehaven Beach! Don’t fancy the hassle and fuss of having to plan, research, and book each detail individually? Resort weddings are seamless and easy, offering ‘inclusive’ packages that are created to cover the bare necessities of your day. There is the convenience of having on-site accommodation (often with special discounted rates), along with allowing a ceremony and reception all at the one spot (no stressing about how you’re going to lug your loved ones around). By having so many inclusions all bundled into the one package and bill it helps you keep on top of your wedding budget and check-list, and saves you a bit of a headache during the planning. Keep in mind that if you are the sort of bride or groom-to-be that wants both hands on the reign throughout and to be in full control of every aspect, it is just important to delve a little further into package inclusions and restrictions. Whilst they are designed for ease and convenience, you may find that there is slightly less flexibility than a DIY wedding. Some resorts may have certain regulations, like noise restrictions due to other in-house guests, or have preferred suppliers, so make sure to ask in advance. Don’t miss the stunning Coral Sea Resort! Get wed on the ocean-edge lawn, dine under the stars with palm trees swaying above or over the water on their private jetty. They even have a private function room should you be anticipating a larger guest list. 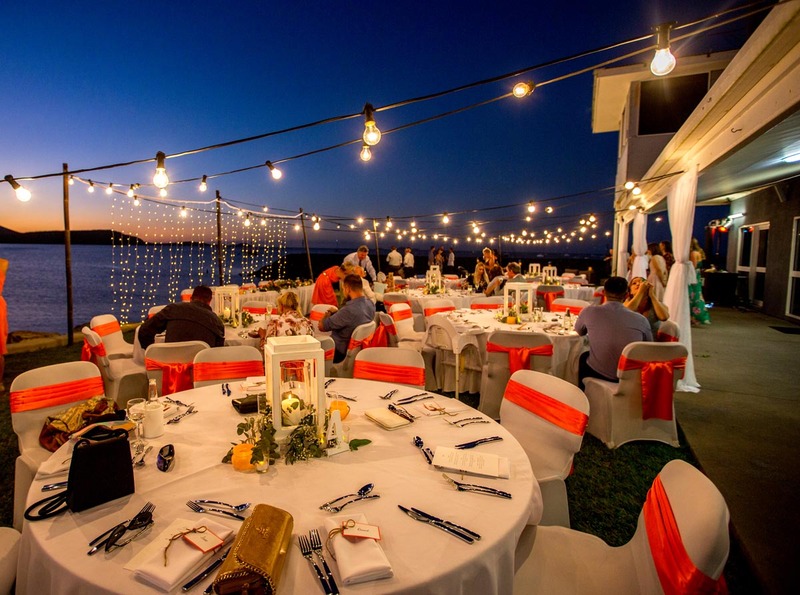 Alternatively, Peppers Resort, set high in the hills over Airlie, boasts stunning views over the Marina, Coral Sea and lush tropical mountains and has a private function room or poolside Pavilion to choose from for your celebrations. 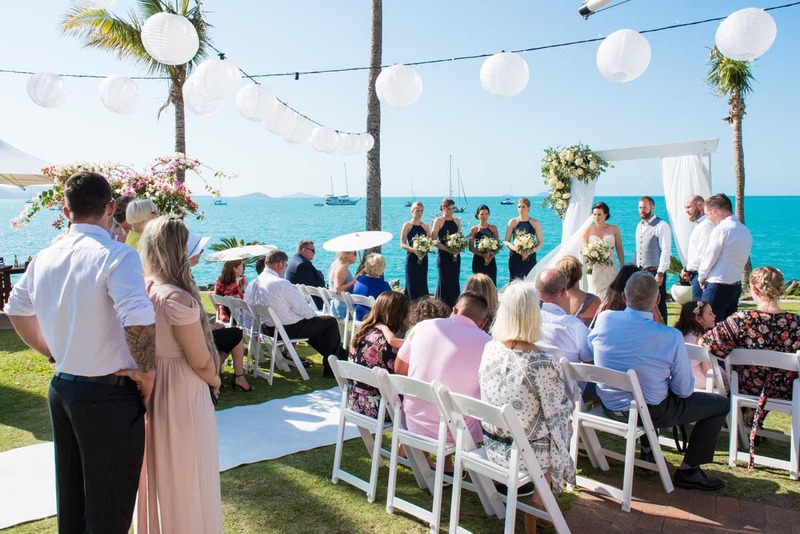 Being a region that entices in so many from all across the world, the Whitsundays is ready and raring to accommodate anyone’s special event. By opting for a venue that is designed for events of all shapes and sizes, you know are in the hands of experienced and dedicated staff that know all the ins and outs of putting together one seriously epic party! Depending on the venue, you can opt for a blank space that allows you to go all-out in creating something wonderfully unique to your day with décor and styling. Alternatively, some venues come pre-beautified and ready for your arrival, allowing for a no-fuss, no-stress, no-worries planning experience. A function venue doesn’t necessarily mean a large empty room hidden away somewhere, like one might initially think: You’ll struggle to find a venue that doesn’t make the most of the surrounding scenic beauty with views from windows and balconies or adjoining terraces and gardens. Plus (and here’s a big plus) no need to worry about Mother Nature as you’re safe and sound under cover. 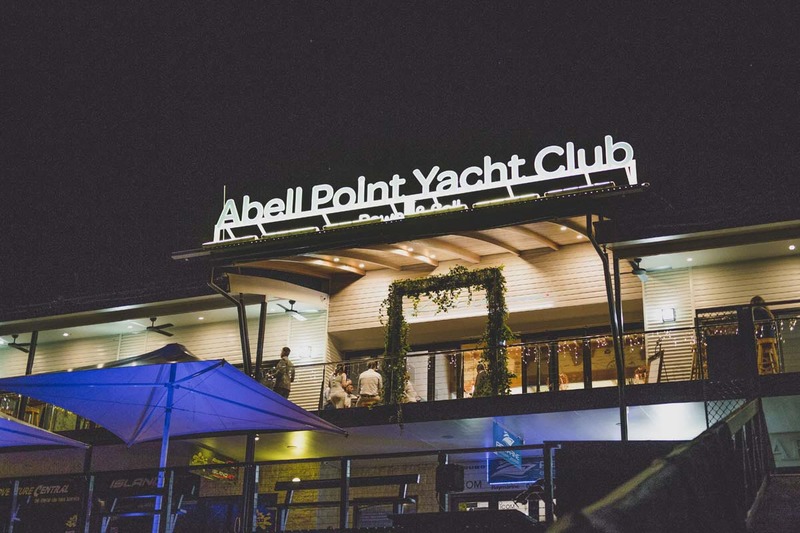 Don’t miss one of the Whitsunday’s newest and elegant options located at the spectacular Abell Point Marina: Lure overlooks the ocea, luxury yachts and breath-taking sunsets. With brand new interior design, Lure is a venue that needs very little extra and truly captures the essence of the Whitsundays. If you’re hunting for the simple and stunning, in a good old laid-back Queensland fashion, then the Marine Club or the Whitsunday Sailing Club are fabulous options. Both are set right on the water and you’ll be able to create a day completely unique to your own beautiful style and ideas. 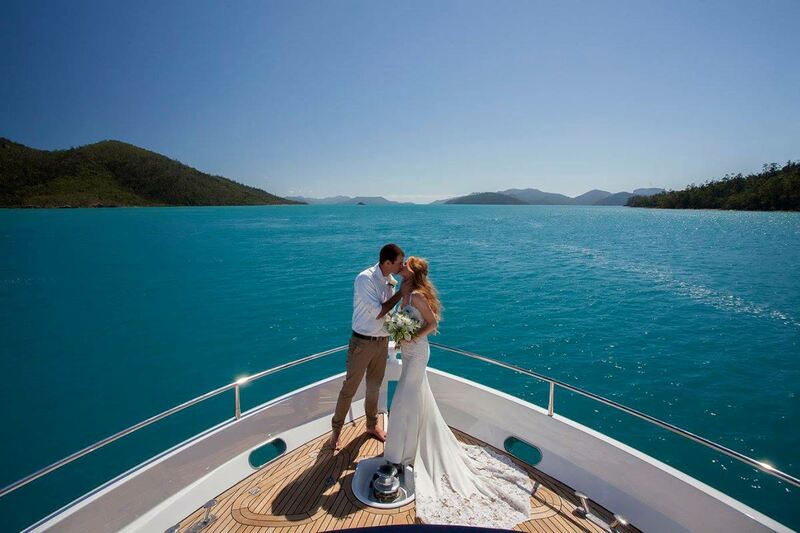 Nothing says ‘wedding in the Whitsundays’ better than jumping on board your own private boat for a cruise through the islands for the ultimate wedding experience! With so many options to choose from, there are vessels to suit everyone’s vision and budget. 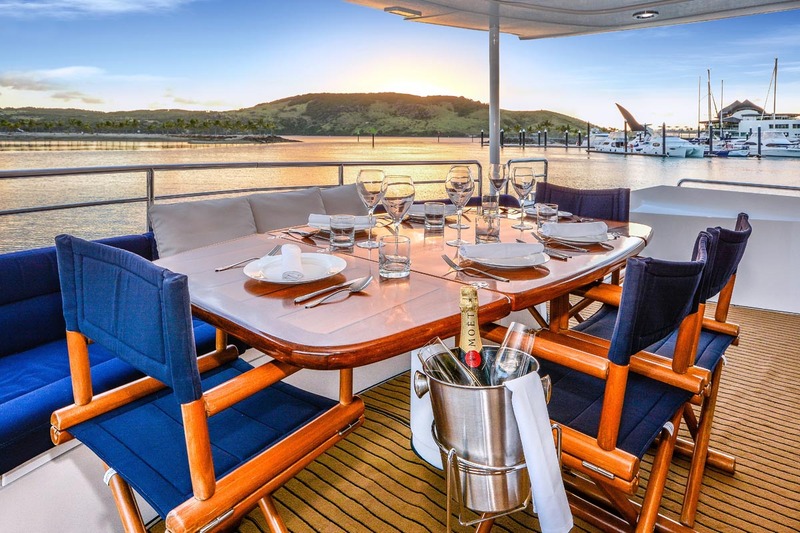 If you’re hunting for something truly magical, then hop aboard and say I Do on the bow or on a private beach only accessible by boat whilst getting treated to the panoramic views of the Coral Sea and the sound of the ocean. If a full day event is not quite your cup of tea (or in your budget), then perhaps a simple sunset cruise to treat your guests to after your ceremony on the mainland. The pros – Oh so many! The cons – Unless you get too sea sick, then the pros don’t even matter. The Whitsundays has so many vessels to choose from to carry you through the maze of islands, coral and beaches. With the rustic character of a traditional Tall Ship, with rigs and sails aplenty, Derwent Hunter offers an out-of-this world experience of whimsical romance and history. Alternatively, the super-sleek and luxe Alani boasts minimalistic style and elegance, treating you and your guests to the 5-star experience of your dreams! There is nothing quite like getting treated to an inclusive experience at a location that specialises and excels in all things wedding. Select a wedding venue or estate that has the experience, know-how, and pure passion for creating wondrous moments and it means you choose a venue that comes ready-made and prepared to cover every aspect of your wedding, giving you the confidence in knowing your whole day, down to the finest detail, will be polished, seamless and dedicated to you. The Whitsundays openly boasts some of the most fabulous options: venues that range from tropical and Balinese inspired settings, to private beaches and bays hidden in the coastline with romantic and rustic charm. Whatever your style, a private wedding venue becomes the ultimate option to an inclusive, exclusive, and seamless experience that you and your guests will enjoy. You might instantly be wary of the potential cost involved to equal this fairy-tale vision? True, cost may become a factor (although who knows, it may surprise you so don’t write it off just yet), but think about the benefits: a specialised venue with specialised service, privacy, and mostly a wow-factor treat for your guests to enjoy. Take the opportunity to explore your varying and exquisite options. Nestled in away in a secluded coastline, where the bush meets the beach, Earlando encompasses private beaches and spectacular surroundings. Located on 6,000 acres of private land, boasting natural beauty from the palm-fringed beach, tropical gardens, mountain range, to traditional outback fields and cattle yards, this family run venue offers focussed and limitless attention from start to finish! Searching for soft white sand, towering coconut palms, tropical bushland and uninterrupted views of the Coral Sea, then Paradise Cove is the pinnacle of exclusivity and natural beauty. Privately owned and accessible by private boat transfers, along with on-site accommodation for intimate groups, the name ‘Paradise’ says it all. Alternatively, we simply cannot forget one of Australia’s most exquisite and sought-after wedding venues: perched on the edge of the Coral Sea, Villa Botanica’s dazzling gardens and architecture is unmatched. This exclusive 5-acre estate is captivating and other-wordly. 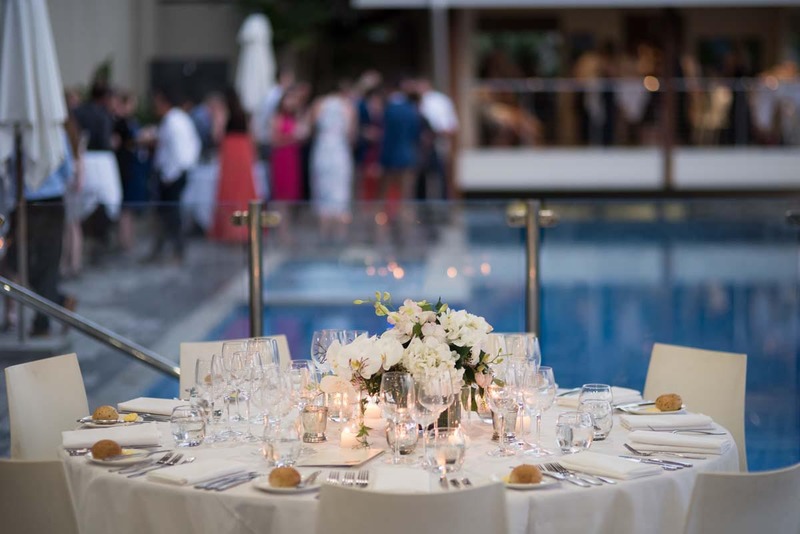 The stylish and sumptuous setting, and meticulous attention to detail that has gone into every inch of this luxurious venue, offers a simply unforgettable and all-inclusive experience that you and your guests will never forget!